Received 2019 January 30; Accepted 2019 February 25. Data from the 2013–2016 graduating cohorts (n=149) were collected. Predictors included verbal Graduate Record Examination rank percentile (VGRE%), quantitative GRE rank percentile, analytical GRE rank percentile, the admissions interview, precumulative science grade point average (SGPA), precumulative grade point average (UGPA), and a reflective essay. The National Physical Therapy Examination (NPTE) and grade point average at the time of graduation (GGPA) were used as measures of graduation success. Two separate mixed-effects models determined the associations of preadmission predictors with NPTE performance and GGPA. Data from admission to graduation of the graduating cohorts of 2013–2016 (n=149) at a 3-year graduate-level Doctor of PT program were collected. Seventy percent of the students from 2013, 91% from 2014, 87% from 2015, and 84% from 2016 released the data necessary for this study’s statistical analyses. The remaining predictors in steps 5–11 decreased the overall within-cohort (between-person) variance. Step 5 revealed no associations of the main effects of VGRE%, QGRE%, AGRE%, and the interview (P≥0.14) with NPTE performance. Adding the interview score to step 5 impacted model fit (P=0.001) and explained 20.4% of the within-cohort variance. 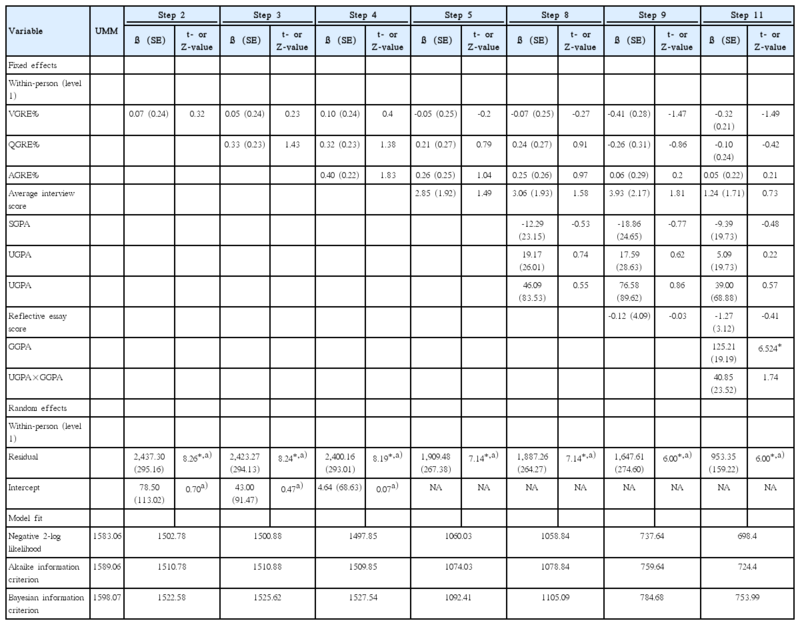 Step 8 conveyed no associations of the main effects of VGRE%, QGRE%, AGRE%, interview score, SGPA, UGPA, and UGPA×SGPA (P≥0.12) with NPTE performance. Adding SGPA, UGPA, and UGPA×SGPA from steps 5-8 did not impact model fit (degrees of freedom [df]=3, P=0.75) and explained an additional 1.2% of the within-cohort variance. Step 9 revealed no associations of the main effects of VGRE%, QGRE%, AGRE%, interview score, SGPA, UGPA, UGPA×SGPA, and the reflective essay (P≥0.07) with NPTE performance. Inputting the essay in step 9 impacted model fit (P=0.001) and explained 12.7% of the within-cohort variance. Lastly, step 11 revealed the only association of this initial model, between GGPA and NPTE performance (P=0.001). The other predictors remained without a significant association. For every 1-point increase in GGPA, the NPTE score increased by 125.2 points. Model fit improved from steps 9 to 11 (df=2, P=0.001) and explained 42.0% of the within-cohort variance. The model fit comparison from steps 1–11 showed significant results (df=10, P=0.001), between-cluster variance was fully explained, and within-cohort variance decreased by 59.5%. 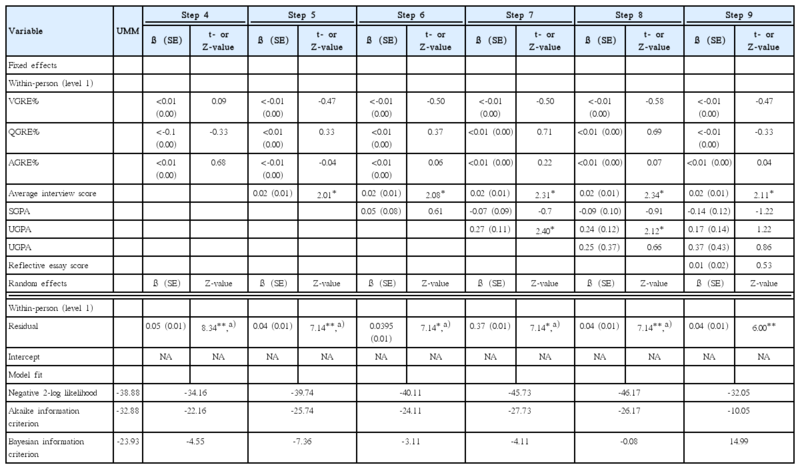 The UMM (step 1) from the mixed-effects model for GGPA (Table 3) suggested that 100% of the total variance in GGPA was within-cohort (ICC=0.00). The initial levels of the secondary analysis (step 4) revealed no associations of the main effects of VGRE%, QGRE%, and AGRE% (P≥0.50) with GGPA. Adding AGRE% in step 4 did not impact model fit (P=0.50) and explained 0.3% of the within-cohort variance. Step 5 revealed an association between the main effects of the interview and GGPA (P=0.04), but no associations of VGRE%, QGRE%, and AGRE% (P≥0.64) with GGPA were found. Inputting the interview into step 5 impacted model fit (P=0.02) and explained 13.4% of the within-cohort variance. Step 6 again revealed an association between the interview and GGPA (P=0.04), but no associations of VGRE%, QGRE%, AGRE%, and SGPA (P≥0.54) with GGPA were found. Adding SGPA into step 6 had no impact on model fit (P=0.54) and explained 0.4% of the within-cohort variance. Step 7 revealed associations between the interview and GGPA (P=0.02) and between UGPA and GGPA (P=0.02), but no associations were found between the other predictors (P≥0.48) and GGPA. Adding UGPA in step 7 impacted model fit (P=0.02) and explained an additional 5.4% of the within-cohort variance. Associations between the interview and GGPA (P=0.02) and between UGPA and GGPA (P=0.04) remained significant in step 8, but no associations were revealed between the other predictors (P≥0.37) and GGPA. There was no impact on model fit from steps 7–8 (P=0.51) and an additional 0.4% of within-cohort variance was explained. Lastly, the association between the interview and GGPA (P=0.04) was again significant in step 9. The other predictors listed remained without a significant association (P≥0.23). For every 1-point increase of the interview score, the GGPA increased by 0.02 points. Inputting the essay scores in step 9 impacted model fit (P=0.001), but did not help to explain the within-cohort variance (R2=−0.007). The model fit comparison from steps 1–9 did not yield significant results (df=8, P=0.56) and within-cohort variance decreased by 16.4%. Conceptualization: GR. Data curation: GR. Formal analysis: GR, MB. Methodology: GR, MB. Project administration: GR. Visualization: GR. Writing–original draft: GR. Writing–review and editing: GR, MB. 1. Ruscingno G, Zipp GP, Olson V. Admission variables and academic success in the first year of the professional phase in a doctor of physical therapy program. J Allied Health 2010;39:138–142. 2. Nuciforo M, Litvinsky Y, Rheault W. Variables predictive of admission to US physical therapist education programs. J Phys Ther Educ 2014;28:112–119. https://doi.org/10.1097/00001416-201407000-00012. 3. Fell N, Mabey R, Mohr T, Ingram D. The preprofessional degree: is it a predictor of success in physical therapy education programs? J Phys Ther Educ 2015;29:13–21. https://doi.org/10.1097/00001416-201529030-00004. 4. Jones PE, Simpkins S, Hocking JA. Imperfect physician assistant and physical therapist admissions processes in the United States. J Educ Eval Health Prof 2014;11:11. https://doi.org/10.3352/jeehp.2014.11.11. 5. Hekler EB, Buman MP, Ahn D, Dunton G, Atienza AA, King AC. Are daily fluctuations in perceived environment associated with walking? 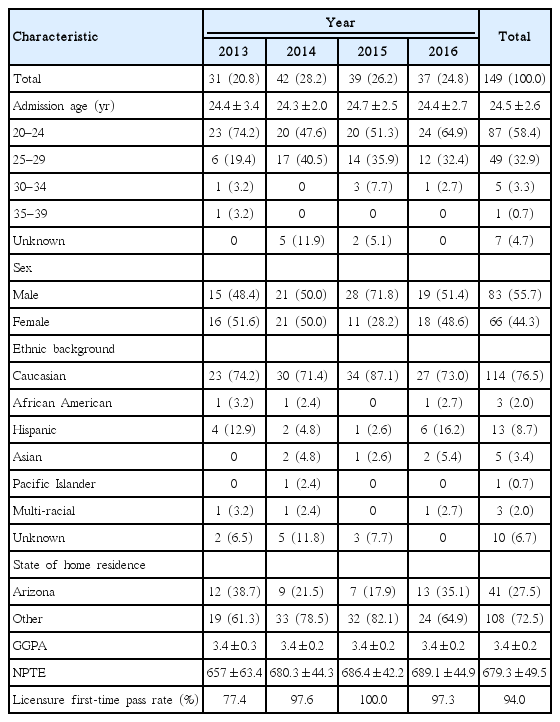 Psychol Health 2012;27:1009–1020. https://doi.org/10.1080/08870446.2011.645213. 6. Capers Q 4th, Clinchot D, McDougle L, Greenwald AG. Implicit racial bias in medical school admissions. Acad Med 2017;92:365–369. https://doi.org/10.1097/ACM.0000000000001388. 7. Physical Therapy Central Application Service. PTCAS application instructions [Internet]. Alexandria (VA): Physical Therapy Central Application Service; 2018. [cited 2017 Apr 5]. Available from: http://www.ptcas.org. 8. Moneta-Koehler L, Brown AM, Petrie KA, Evans BJ, Chalkley R. The limitations of the GRE in predicting success in biomedical graduate school. PLoS One 2017;12e0166742. https://doi.org/10.1371/journal.pone.0166742. 9. Jette DU. Unflattening. J Phys Ther Educ 2016;30:4–10. https://doi.org/10.1097/00001416-201630030-00003. 10. Cook C. 20th Pauline Cerasoli lecture: the Sunk Cost Fallacy. J Phys Ther Educ 2017;31:10–14. https://doi.org/10.1097/00001416-201731030-00005. 11. Wise D, Dominguez J, Kapasi Z, Williams-York B, Moerchen V, Brooks S, Ross LJ. Defining underrepresented minorities and promoting holistic review admission strategies in physical therapist education. J Phys Ther Educ 2017;31:8–13. https://doi.org/10.1097/jte.0000000000000009.